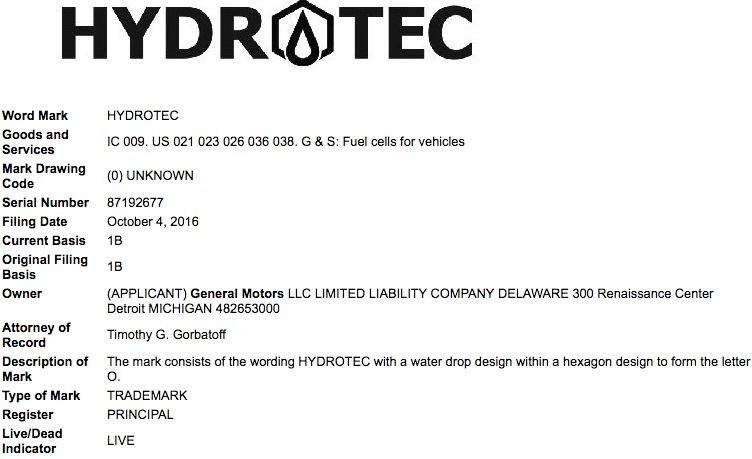 General Motors has filed two applications to register Hydrotec as trademarks with the United States Patent and Trademark Office (USPTO), GM Authority has discovered. It would appear that GM’s fuel cell vehicle efforts will be branded as Hydrotec, following the common theme of GM’s Ecotec engine brand. The automaker began developing fuel cell vehicle propulsion tech on its own decades ago, resulting in a fuel cell-powered capture test vehicle fleet while delivering hydrogen-powered vehicles to the U.S. armed forces such as the upcoming Chevrolet Colorado ZH2. In 2014, it partnered with Honda to collaborative develop the technology and share development costs. Stay tuned to GM Authority as we follow this story now and into the future, and follow our coverage of Hydrotec news.